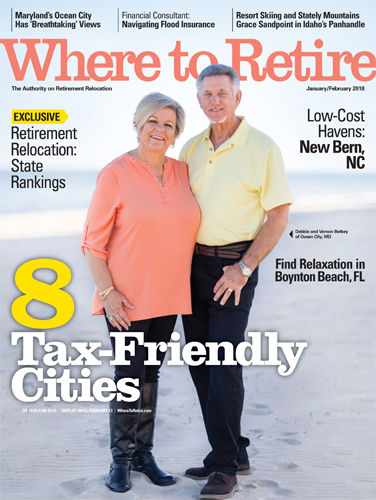 New Bern has been selected as a top retirement destination by Where to Retire, the only magazine in America geared toward helping people with retirement relocation decisions. New Bern is profiled in the January/February 2018 issue, available nationwide on Dec. 12, the magazine announced in a news release today. New Bern gets promo’d on the magazine cover, left, under the headline, “Low-Cost Havens.” Where to Retire Editor Annette Fuller said New Bern possesses qualities important to today’s retirees. “Say hello to North Carolina’s stunning Inner Banks — the lesser-known cousin to the state’s Outer Banks. The star city is New Bern, at the confluence of the Trent and Neuse rivers. For a small city, it has an abundance of arts offerings, including downtown galleries and the Carolina Chamber Music Festival. Colonists settled here, and downtown still has many 18th century buildings. The best New Bern trivia? Pepsi was invented here in 1890s by a drugstore owner,” Fuller said. Each year, 700,000 Americans relocate to new towns to retire. Generally, relocating retirees are healthier, better educated and more affluent than those who choose to not relocate, the magazine said in its news release. They bring significant economic benefits to their new states and hometowns. It has a national circulation of 200,000 and is sold on various newsstands and at Barnes & Noble bookstores.